When we hear about discipleship and “spiritual disciplines” it often conjures images of long lists of dos and don’ts in the pursuit of the seemingly endless goal of “self-improvement”. But discipleship is not becoming something we are not. What discipleship is about, however, is actually learning who God created you to be and walking in that identity. Discipleship is about learning from those a bit further down the path and gaining the tools you need to nurture what you’ve been given already by Jesus. It’s about learning how to really dig into the Bible, how to pray more effectively, how to listen to God when He wants to teach you about how to become more like Him, and how to repent and receive forgiveness when we inevitably stumble along the way. We believe that true discipleship happens in small groups, where real community comes together, grows deeper, and gets to truly know and love each other. We’ve got a number of different small groups, each ready to meet different needs for wherever you may be in your walk with God. Most of our small groups meet in homes during the week. It’s our goal that everyone in our church can become part of a weekly group of study, community and prayer. 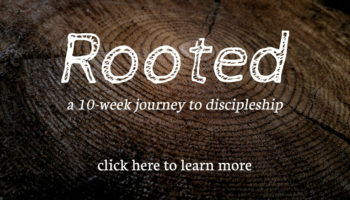 If you’re looking for a place to start, our Rooted Series is perfect for new small groups just getting started on the journey of discipleship. The “Rooted” series is a 10-week journey where we help you shift your perspective and discover how to get rooted in a vital and personal relationship with Jesus.